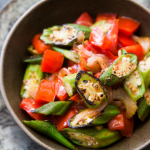 Sautéed fresh okra with tomatoes is a great way to enjoy okra in a healthier form. It's an easy and delicious side dish full of health nutrients! Remove bacon from pan and sauté okra, onion, pepper and celery until tender. Add tomatoes, salt and pepper and cook until tomatoes are heated through. Garnish with crumbled bacon, if desired.